BANGI, 19 May 2014 – Lecturers from the Faculty of Engineering and Built Environment (FKAB) should become consultants whenever they are ready to work in the field as it would help improve their teaching and learning practices. Fluid Mechanics lecturer Professor Dr Mohd Sobri Takrif said consultancy work helped in terms of networking between the practicing engineers, lecturers from other disciplines, industry players and government officers. Sharing his experiences on the advantages and challenges of being a consultant at the FKAB Sharing Discourse Practices in Teaching and Learning Series 6: “Consultancy Experience in the National University of Malaysia” (UKM) recently, Prof Sobri said new ideas for teaching and learning as well as materials are available in the consulting field. He was one of five panelists at the discourse who has considerable experience in consultancy work with both the private sector and government. Consultancy helps the engineers to understand how things are done in the industries while giving them the opportunity to challenge themselves in real work situations. This include management of time to shift in between unfamiliar working environments while they are also expected to know the professional and ethical limits in the field while giving them the chance to choose where to serve thereby avoiding from handling too many jobs at one time. Another panelist Associate Professor Dr Zainuddin Sajuri, a lecturer from the Department of Mechanical and Materials Engineering, shared his experiences since 2007 in several small scale industries that needed trouble shooting one of which was a tower crane related accident in Putrajaya. He said such experiences in the field can also assist those studying for their post graduate degrees. Another panelist, architect Dr Mastor Surat who is a Senior Fellow at the Department of Architecture was an architect for 25 years before joining UKM as a lecturer where he was able to start an architecture programme incorporating the needs of the industry. Dean of FKAB Prof Ir Dr Mohd Marzuki Mustafa, also a panelist said those wishing for an extra income can involve themselves in consulting work. However, if they wished to work in a more relaxing environment, the consulting field is not suited for them. Another panelist, Asso Prof Ir Dr Othman Jaafar, a senior lecturer at FKAB spoke about his experiences while doing consultation works at the Public Works Department (JKR. He quit to become a lecturer because of the chaotic environment there. He said consultants were appointed for a certain job because some of the existing engineers at JKR needed expert help for the work that they could not do by themselves. Dr Othman said ethics was very important in the field as thus had turned down several consulting works for projects that would have harmed the environment. 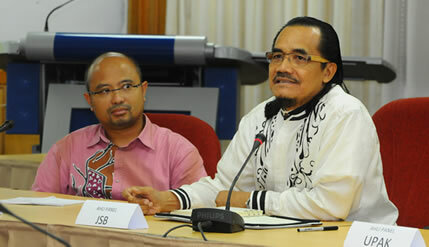 The discourse organised by FKAB was chaired by Assoc Prof Dr Roszilah Abdul Hamid, from FKAB.